Most people use a collapsible tube every day when they brush their teeth. Most of these are laminate tubes, formed from a strip of laminated plastic with a separate end and cap applied. Other tubes are made of extruded aluminum. Tube filling speeds can range from 20-30 tubes per minute to 400+. Many products are supplied in plastic tubes that are injection molded. These can be identified, usually, by the way that they return to their original shape after squeezing and dispensing. This retains the smooth cosmetic appearance of the tube but at the cost of allowing air entry as the tube re-expands. All three tubes are handled the same way except for closing. The tubes are brought to the tube filling machine open end up in partitioned boxes and loaded in a hopper for automated feeding into the filling machine’s transport pucks. Alternately, they may be placed by hand, or in higher speed machines, by robot directly into the pucks. After placing in the pucks, open end up, they index to a cleaning station on most machines. A nozzle is lowered into the tube and blows ionized air to remove any debris. A vacuum collar around the nozzle catches the debris. The tube indexes to the filling station. A nozzle lowers into the tube and dispenses product. The nozzle rises as it dispenses to stay slightly above the product level in the tube. Care must be taken not to splash or drip any product on the tube seal area. Either before or after filling, the tube is rotated into the proper orientation. Typically the puck and tube are lifted and spun until a registration mark printed on the tube is detected, usually by a photoeye. Rotation is stopped and the puck/tube lowered and locked in position. After filling, the tube indexes to a hot air station. Heated air is blown around the open end of the tube, softening the plastic. The tube moves to a sealing area where sealing jaws pinch it closed and, because it has been softened in the hot air station, weld the insides together sealing the tube closed. Replaceable metal characters are often mounted in the sealing jaws to deboss a lot or date code in the crimp material. Note black on seal registration mark for axial orientation. The tube indexes to the trim station where excess material is cut off. This provides a clean aesthetic appearance. In some cases, shaped sealing and trim dies provide a shaped end to the tube. Tubes index to the ejection station. In some fillers an inspection detects and separates good and bad tube, sending the bad tubes to a reject bin. 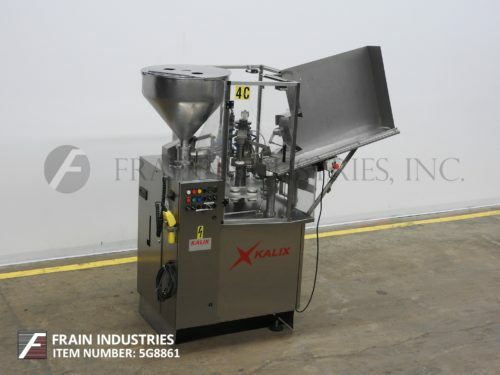 Inline, tube filler, sealer, trimmer with speeds – depending on materials and applicatoion. 5 stations unit indexes pucks with single tubes into the first 2 stations which are bottom up fill stations, to a pre-heat seal station, to a seal and cool station and then to a trim station. Tubes are transfered on a 118" long x 6-1/2" wide 2 belt conveyor system with bosch puck holders and a A/B Logix5550 controller, with A/B panel view 1000 swing arm controls and has test and run switch, three e-stops, safety guarding and tubular frame with lock down legs and casters, inline roller in feed and curved roller discharge conveyors. Saga FS22P, Semi automatic, plastic tube filler and sealer . Tube size range: 1/4" to 2-3/16" in Diameter. Fill size: up to 9oz. Equipped with a 2.5 ft³ stainless steel product hopper, air tube cleaner, twin piston filler, fill nozzle, 22 pocket rotary turntable, hot jaw tube sealer, water cooled seal jaws and variable temperature and speed controls. Stainless steel contact parts. Mounted on height adjustable legs. Speed dependant on materials and application. Change parts required to accommodate size range. Cotuplas RS61, Plastic or laminate tube filler and sealer rated from 10 to 40 tubes per minute – depending on materials and application. Tube size range: 13.5 – 40mm in Diameter x 55 – 230mm in Length. Currently equipped with a 4 oz piston. Rotary 12 puck unit equipped with autocassette empty tube loader, registration, large hopper to piston fill plunge fill with cut-off. Branson 187P ultrasonic tube sealing with 4" wide jaw, with coder in jaw and trim sectons and a cut-off station. Tonazzi Model COLIBRI 1001, automatic, stainless steel, twin head tube filler rated from 20 to 120 tubes per minute – depending on materials and application. Tube size range: 3/8" to 1" in Diameter; 2" to 9-3/4" in Height. Fill range: 0.1 oz to 13 oz. Equipped with automatic tube feeder, with low tube sensor, 12 position carousel, registration eye, diving nozzles with positive shut-off, no tube / no fill, hot air seal station and trim station. A/B SLC 5/04 PLC and interlocked Lexan guarding. Change parts required to accommodate size & fill range.